3D printers will be used by Russia to print drones faster, and to reduce delays in production time while significantly cutting costs. Opinion is however, divided among Russian experts some of whom doubt the efficacy of the project as the gap is not only technological, but also legal. Rostec Corporation unveiled a UAV demonstrator in April 2015, with a wing span of 2.4 metres and weighing 3.8 kg. The demonstrator is capable of reaching speeds of 90-100 kms/hour and it can fly for one to 1.5 hours. "We managed to create a drone in 2.5 months; all the way from the concept to the working prototype,” Vladimir Kutakhov, representative of the state corporation Rostec, said during the second International Conference on “Unmanned aircraft – 2015”. “The actual production time is 31 hours and the cost of production of the demonstrator, under 200.000 rubles," he said. "At one time, CAD technology resulted in reducing the time spent on design. Now we speak about the use of additive technology which is expected to reduce the time for prototyping and pre-production. The downside is that these technologies are still largely "raw". In my opinion, the use of such approach when creating the elements of power structures is questionable,” Denis Fedutinov, leading Russian expert on unmanned systems and robotics told RIR. When it comes to the production of unmanned aerial vehicles (UAVs), Russia finds itself below world standards, although the Soviet Union was one of the leading developers of UAVs. Russia’s leadership has now set an ambitious challenge for the Russian defence industry; to ensure that the share of Russian-made UAVs is at least 5% of the world market for UAVs by 2022. The world's leading UAV manufacturer today is Israel. The country exports 80% of drones it produces to 49 countries. Russia can so far boast of the tactical reconnaissance drones of its design, operated in the interests of its Armed Forces. Domestic UAV developers are now paying attention not only to the use of drones for military purposes, but also for “civilian use” for them; in the oil industry, agriculture, prospecting works, monitoring of floods and forest fires. Expanding the scope for usage of drones faces another problem: the lack of a legal framework for safe operation of unmanned aircraft in Russia. The most serious impact has been on the development of monitoring systems, in areas where the widespread use of drones is being projected, said Vladimir Shcherbakov, deputy chief editor of a specialized magazine on unmanned aircrafts, UAV.ru. Until this problem is resolved, setting a large-scale production target for UAVs will not help to conquer the market. Drones will simply have nowhere to operate in Russia, making it difficult to export them, since drones that do not fly domestically would create doubts among potential buyers. There is hope that the government will resolve this problem in the near future, and drones would become legally viable in Russia. 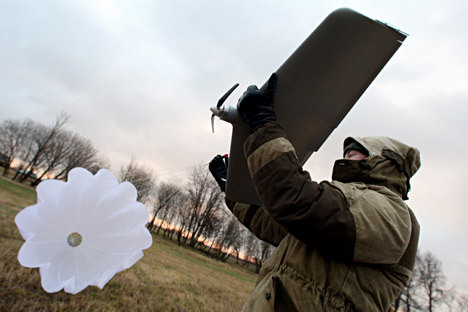 In June 2015, the State Duma considered and adopted the first reading of the document, which lays the legal foundation for the use of drones in Russia. These changes "will enhance the overall level of aviation security." Also, they will form the legal basis for the use of drones in the interests "of various sectors of the economy, meet the challenges in the fields of defence and security of the Russian Federation", and other areas outlined in the conclusion of the Duma Committee on Transport.